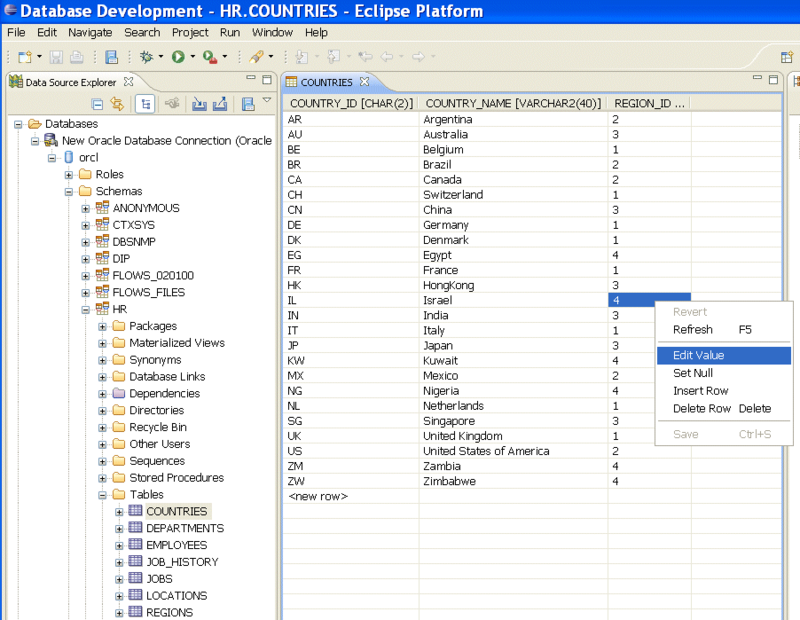 Recently Oracle released the Oracle Enterprise Pack for Eclipse 11gR1. To find out more about it, I spoke with Ashish Mohindroo, Sr. Director, Product Marketing, Oracle Fusion Middleware, about the product. One of the best things about the pack is that, while the JPA/ORM tools will work best with Oracle, any database that has a JDBC driver is supported. DZone: What is the Oracle Enterprise Pack for Eclipse for? Ashish: It is a certified set of Eclipse plug-ins that is designed to help develop, deploy and debug applications for Oracle WebLogic Server and Oracle Database. It installs as a plug-in to your existing Eclipse, or will install Eclipse for you, and enhances Eclipse's capabilities for Java, Java EE, Spring, ORM and Web Services. DZone: What's new in the 11gR1 release? Oracle Enterprise Pack for Eclipse 11gR1 introduces a new graphical JAX-WS Bindings Customization Editor. This editor supports new and existing JAX-WS bindings files allowing you to modify web service class and method names, method signatures (wrapper versus non-wrapper), add Javadoc, and attach handlers. New code completion templates have been added for Web Service Client Proxy references. Oracle Enterprise Pack for Eclipse 11gR1 provides a set of ready-to-use common code snippets that you can access through code completion templates and insert in your JAX-WS-enabled Web services Java code. This is useful when you instantiate a Web service client. New wizards are included to create a JAX-WS Java Web Service from a Spring Bean. Users can select a Spring bean from the application context file to create and wire up a WebLogic Web Service class. The generated Web Service includes delegate service calls to the Spring bean implementation. Oracle Enterprise Pack for Eclipse 11gR1 includes a editors for the common Weblogic Server deployment descriptor, weblogic-ejb-jar.xml as well as JSR 88 Deployment Plans. These new editors include wizards, validation, and code completion to streamline application configuration. Context sensitive help (hit the F1 key) has been added for every field in the editors to help users understand the semantics of these descriptors. Oracle Enterprise Pack for Eclipse 11gR1 supports editing of existing JSR 88 Deployment Plans or can create new Deployment Plans through the File > New > Java EE menu. Oracle Database Tools have been enhanced to provide better support for Oracle Database 10g and now Oracle Database 11g. New project configuration wizards and facets have been added for Apache Struts 1.1, 1.2, and 1.3. These new facets will configure Struts libraries on the project build path or download new Struts libraries if required. Users can also choose to generate Struts configuration files during project setup. DZone: Is it only for Oracle WebLogic developers, or will it work for any app server? Ashish: The plug-ins are designed to work best with Oracle WebLogic, but support all major app servers via the server plug-ins included with Eclipse. While some features are Oracle Weblogic specific, the Oracle Enterprise Pack for Eclipse plugins also allow you to develop server agnostic applications. DZone: Apart from support for Oracle databases, how does this differ from the SpringSource Tool Suite? Ashish: Let's start by looking at how they are similar. Both provide tools for working with SpringBeans, a part of the Spring framework that deals with Java object representations of data (usually in a database). But that's where the similarities end. The SpringSource tool suite is focused on tooling other parts of the Spring framework, (Spring Web Flow, Spring Batch) and tools for OSGi development. Oracle Enterprise Pack for Eclipse is focused more on Web Services, Oracle WebLogic development, database, JavaEE, and ORM tools. DZone: Is there a reason that you developed these plugins on Eclipse rather than NetBeans? Ashish: Yes. Eclipse is the most popular IDE in the market for several years running, so it's a natural place to start. Also, it's an important part of our Eclipse Foundation responsibilities as a strategic developer member of the foundation. DZone: What is planned for future versions on the Oracle Enterprise Pack? Ashish:It's important to understand the strategy behind the product to place future work in context. Oracle Enterprise Pack for Eclipse's goal is to match the pace of the underlying Eclipse platform via lightweight, fast releases. The strategy also calls for donation of features to Eclipse that are covered by the charter of the core Eclipse platform / Web Tools; and innovating in areas that Eclipse leaves unaddressed or are Oracle-specific technology extension. With Oracle Enterprise Pack for Eclipse's frequent release cycle, we are able to provide new features to customers every few months through our OTN site and Eclipse Update. With each release we build on existing feature areas such as new Oracle WebLogic, Web Service or Oracle Database tooling. Our upcoming release is focused on web application enhancements.